Rest In Peace, Sophia. Your life was too short but sweet. You were a character and a sweetheart, and I hope you are feasting on grapes and bread in chicken heaven. Yesterday I lost one of my Golden Laced Wyandotte. She was 9 months. She was one of two GL Wyandottes in the flock out of 7 total chickens. Everything was fine days before. I didn't notice anything strange. Yesterday morning my husband said he found her in the corner of the coop when all the others ran out once the door opened. He visually examined her and just let her be to check up on her later. He soon saw her slowly come out of the coop, but instead of walk down the walkway, she kind of slid instead of walked. He thought maybe something was wrong with her leg? She sat down at the bottom of the walkway. He decided to let her be for now and see what she's like when he got home from work. My husband left for work. I stopped off at home for lunch, I let my chickens out of the run to roam the yard. I counted 6. I saw her still in the run, sitting in the corner. She didn't look like she wanted to budge. Almost like she was brooding, but on the ground. We had finally just got through one of our hens brooding and thought maybe this was a different version of that? I noticed her head was low but no other signs indicating something was wrong. Before I left to go back to work, I checked on her and it looked like she was falling asleep. She was breathing and almost looked like she was nodding off. I decided I would go back to work for an hour or so and come home to do a thorough check on her. A thick fog rolled in. When I arrived home 2 hours later, she had passed. It looked like she turned around at some point, but I couldn't think of why she would do that or when she would have had the energy. I wish I had examined her before I went back to work. My husband regrets not checking her out before he left. But in the end we buried her in the corner of our yard. I thanked her for the happiness and all the eggs she provided us. I told her I wished I could have done more and that we loved her. I don't know what did it and it was so sudden. The fog finished her off I think. She died peacefully in the Oregon sun. Thank you so much for sharing Chicky's story with us, Jasmine. Sometimes, chickens do just die suddenly and for no apparent reason. But while she was with you, she had a good life, and that's all we can do for our flock. RIP, Chicky. You were loved. Spooks had only been with us since for three months, fresh from the local chicken emporium. She was a white-faced black Spanish. True to her type, she was fiercely independent of our other seven chickens, always lurking in the background. We've only been keeping chickens for ten months and Spooks is the first one to leave us so it's quite a shock, completely unexpected. I found her this morning, in the corner of the coop, on the floor. So long, Spooks. So long. All the chooks I have had have their own personality. Their lives have value. To me, much more than so many dumbo oxygen thieving non-contributors. Not only do they work their bum off (so to speak) laying countless delicious eggs, they provide amazing therapy when life seems complicated. Thanks for your elegance and placid countenance. She was such a pretty girl and was fine yesterday. She was dead in the coop this morning. I’m so upset; she was 15 weeks old, the leader of our little backyard flock and even flew two feet off the ground a few days ago! 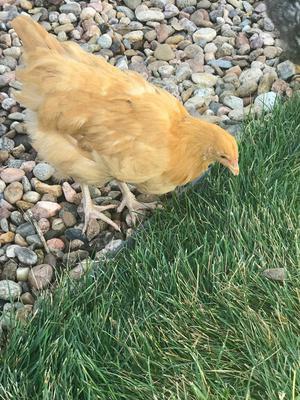 I think she was the happiest, bossiest Buff Orpington you’d ever meet and I’m going to miss her pecking my boots every day while I watched all the girls scratch up the lawn. I hope she felt safe and loved. WannaBe was a sweet hen. She never bullied the other hens and was always ready for a pet. She was quick to greet us every time we came to the coop and she loved sunflower seeds. 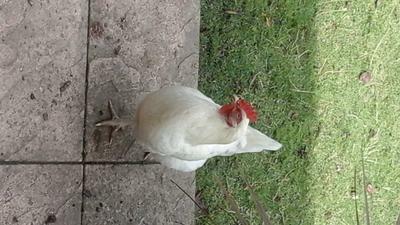 She was a therapy chicken and would go to work with me to work with troubled teens. She was truly a good hen and well loved. Yolko was among our first pullets bought in 2014. She actually never laid many eggs but she was a cool chicken anyway. Not sure what caused her to pick today to depart, but she is in the great pasture in the sky. Dixie was undeniably our favorite of our 8 chicks. She had the cutest stripe down her back and was oh-so snuggly. She curled up in your palm and fell gently asleep. We lovingly named her on the drive home. When Dixie was older, she was, along with the other chickens, transferred to an outdoor coop. A week passed, and all was well. Unfortunately, one day, we strolled down to the coop to tell our chickens goodnight. We counted the chickens; 1, 2, 3, 4, 5, 6...7. Where was Dixie? She never returned. Therefore, we can assume that a mean, mean raccoon stole her from us. Our lovely red hen died today after a few periods of ill health, from which she would rally and recover for a while. I've not been keeping chickens very long, and as she didn't seem to be suffering too much Ive kind of left her to it. This week though she was poorly looking and it got to today and I thought maybe this was it. I sat her on my knee and she ate a pot of pureed fruit salad, then she went under the honeysuckle with a slight breeze and dappled sunshine and fell asleep. When I went back to see her she had passed away. I was very philosophical at first but now I'm actually really upset, but I'm glad she had such a lovely last day and a peaceful passing. I've got 7 other chickens, but I will miss her. When I first got them I thought "ooh great, eggs" but I didn't appreciate how much the little beggars can play on your heart strings. Our sweet little Minnie passed away suddenly yesterday. She was just shy of 11 months old. Min was the most cuddly Buff Orpington you'd ever meet. She was a petite little girl and started laying early which may have led to her constant struggles with being egg bound and her short life. Yet in her time with us she was loved and cared for in the best way possible. I will miss how she would come running up to us when she saw us and how she would fall asleep in my lap when I held her. I only wish she had had more time on this earth to enjoy all those things she loved: grass under her feet and a belly full of fresh fruit! Goodbye precious girl, we will never forget you! My wonderful lovely girl died suddenly today. 6 weeks ago she had prolapse. I took her to the vet who fixed her up and gave her a hormone blocker. She just had her second dose last week. This morning she was slow to come out to free range but she answered my call, ate and drank and ran around with the other chickens. Then just this evening I went out to check, and found her dead under the roost. I loved how tame she was. We hatched her ourselves. My toddler gave her kisses. She was the sweetest chicken and will be so very missed. All of my Silkies are special because I raise them as pets, so when I lose one it hurts deeply. In the past I have known the cause of death. 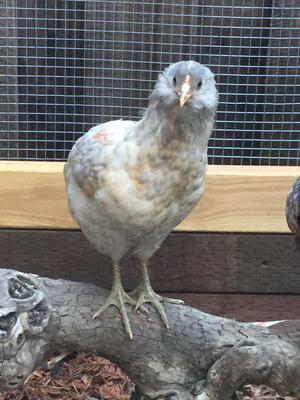 But today I lost my little 5 month old Silkie, Moana. She was hatched and raised here, no other kind of bird for me, except of course my first birds. 5 years later I have 3 of the original five. Moana was perfectly healthy. Yesterday seemed like any other day when I let everyone out to free range, but I think she may have succumbed to Sudden Death. At the end she flapped violently and appeared to perhaps have a seizure. She was a special little hen, so sweet and loved to cuddle. Like all of my babies she had her special sleeping place and tonight it sits empty, except for the tears of course. I will never get used to losing them, and just do not understand why when everything seemed perfect this happens. I love you Moana, rest in peace little one. I am so sorry and I will miss you so. Queen was an 11 mo Buff who loved sunflower seeds, lettuce and cantaloupe. She was the biggest of the 6 chicks I raised. She had a personality all her own and greeted me when I walked out the back door and followed me around when I walked in the back. I found her dead in the corner of her run yesterday morning without any reason, warning, etc. I am shocked about how devastated I am with her loss. She was the first buddy I had with this first flock I raised. The only thing I can say is that I hope I gave her a good life while I had her. Not many people understand chicken losses but when you have a connection with a special being, no matter the creature, it's heart breaking to lose them. I actually tried to not get attached - but she was an exception. Here's to the bird I called my buddy, Queen. She was a hybrid, mixed part hen and part turkey. 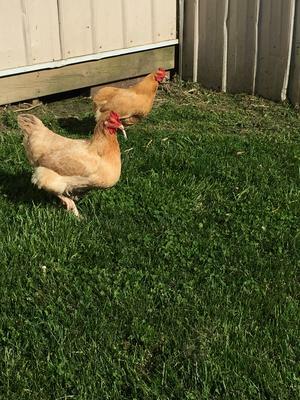 When some people sold their house, they decided to leave their chickens behind, and the new owners didn't want them. So I took them. This particular hen looked very strange, I thought she had lost feathers, so put her aside in her own special coop so she could get a chance to regrow her feathers. But much to my amazement she was supposed to look like this! During Maria's stay with me, she got along with all the other hens, but I noticed one day she didn't want to roost, she just wanted to sleep in the nesting box. She did this for about 4 days, still acting normal except for that. I found her dead one morning. No apparent reason. During her life with me, visitors would always want to photograph her, because she looked so unusual. They had never seen a hen that was part turkey. It broke my heart that she died so suddenly, but at least she had a good life at the end with me. Foggy was part of the newest flock of hens that I raised - 6 added to the sole survivor from my previous group, who was 2 years older than them. I'm sad to say that Foggy - a white leghorn, roughly 3 years old - was put down today (July 5th 2017). Up until a few months ago she never stopped providing me with huge, white eggs, but unfortunately on the 2nd she got sick and constipated which led to Flystrike (please don't Google if you have a weak stomach). She had a long, good life being cared for by me, so I decided her time had come and she should be honored here. I'm sure her Australorp/Americana/Wyandotte sisters are gonna miss her, and I will too. At least her suffering is over. The very first day I moved into my new house, I opened the gate to the chicken run and Fluffy was the first chicken to run up to me. She kind of made some noise and then the other three chickens joined her. Fluffy always tried. She liked to discover new things and she did not bother the other chickens in the coop. I think she was brave. She laid on the cement and she liked her space, her "me bubble". Fluffy was cute. Even though lots of her feathers were gone, I still liked her. When I first met Fluffy, she was only missing feathers on her neck. She could fly up to the compost and she would play with the other chickens in the dust bath. Fluffy would always be the first one into the coop to get to her favourite spot: the left corner. She always slept there. Fluffy enjoyed pecking at the ground and quite enjoyed her alone time. She liked to stand in spots and close her eyes and just walk around and relax. I noticed that she really liked peaches when I would put them in the compost and give them to her. Fluffy was the best chicken ever. Goodbye, Fluffy. Bobby and her sister, Pipsqueak, were the first and only banty girls we adopted. They were flighty for the first 3 years of bringing them home, but they were so very fun to watch scream with excitement when chasing the other chooks for treats. And of course they were so very tiny compared to everyone else so they were the cutest in the flock, in my opinion. So healthy and even hearty in the cold. Earlier last week Miss Bobby started panting and I assumed it was the heat. I made an electrolyte mix for the flock, but she was the only one suffering. She stopped panting a few days later and all was well again. Well, last night I found her not eating or running around with the rest of her friends. I brought her in and wrapped her in a towel. I knew I was going to have to say goodbye to my lil squeaker. She passed in my husband's arms, peacefully. We love you and will ALWAYS remember you, Miss Bobby. Thank you so very much for being a part of our lives. Poppy had to be put to sleep today. Her and her sister Holly were the last clutch of chicks bred by my dad, Michael, who passed away suddenly in July 2016, just after Poppy had hatched. Dad loved his hens and ducks and would have thought her a fine hen. Poppy brought me great comfort and joy and I thank her for that. Love you, my little friend. Claudia: She was my baby. I rescued her when she was a 2 days old baby from a school science fair where she was used for demonstration purposes. After that, she was going to be discarded so I took her home. She was so tiny yet so lively. I raised her with much care and love. Like a princess. We became attached and bonded. She gave me 2 wonderful years full of love and fun. She was amazing: she would come to me when called by her name, she could communicate to me in many ways. She was so clever and loving. She would respond to my hugs by tucking her head between my neck and collarbone. She would also do that thing of preening my clothes with her beak. Some months ago, I became seriously ill and I had to rehome her with a friend while I stayed at the hospital. She was in my mind during all that time and all I wanted is to hug her again and kiss her. Unfortunately, she died one day before I was discharged. My heart sank when i was told she was gone. I buried her and visit her grave everyday and cry my eyes out when I do it. I am seriously depressed and all I want is her back. I loved her more than I ever loved a human being. I just want her back. I miss you, Claudia. there won't be another you. You were so special to me. I love you and I will always do. I am crying while I am writing this. Jade was 15 months old when she died suddenly in our backyard. My 12 year old daughter found her shaking under the coop, head down, like she was asleep but moving. I ran out to find her already dead. We raised Jade since she was 10 days old with her four other sisters. Jade was an Easter Egger with beautiful silver and gold feathers. She was always a beauty, and we would call her our princess. Not only did she posses outside beauty but she was bold, friendly, curious and a friend to all of her fellow flock. She was most often with her sister, Olive, our other Easter Egger. Olive is more shy and would pal around with her bolder sister Jade. Jade was first to come out of the coop in the morning, often flying, and first in line to receive treats. The day she passed she was doing all these normal behaviors, including laying her last blue egg. We don't know why Jade left us so early in her life but we know she felt loved and appreciated and she had a good life. She will be missed greatly by Olive, Marigold, Lucy and Violet, who were confused and upset by Jade's absence. My three kids and I will also miss her. She was a spunky, happy girl and we won't forget our time with her. I’ll start off by saying, Old Yellow was a loyal hen. I had raised her since she was only a day or so old. She had been raised with 9 other “litter” mates, including an orphan duck I took in. She had escaped death twice. Once from a coyote attack that took the lives of 6 of the 9 girls. Then another from an attack brought on by a fox. She was a survivor. Old Yellow was the best layer and remained loyal until the end of her days. She lived a good life out in the countryside of the Midwest. Being let out to free range during the day and secured in the hen house at night. I found her this morning in her favorite sleeping spot of the hen house, lying on her back. I believe she died of heart failure as she was acting strangely on the day leading up to her death. She was given a proper burial on the 30 acres which I live on. Old Yellow was loved, and she passed knowing that. Sweet dreams my girl. May we meet again. I had always wanted a Silkie ever since we moved. One day my mom and I went shopping, and we got an Americana and a Blue Silkie. We named the Americana Canty, and the Blue Silkie Noodle. They were the best chickens I could ever have. Yes, Noodle would chirp loudly when she was lonely, but that just meant I could hang out with her more often. We then moved them out of our house when we thought she was old enough. But what we didn't know was that because Noodle was still young, moving her around made her stressed. It slowly ate away at her. Today, July 12th, 2017, Noodle was deathly ill. We did everything we could, but it just didn't work. Around 1pm, Noodle chirped at me, and died in my arms. I cried. But I'm noticing things that will always remind me of her and make me happy. I will always miss Noodle, how she happily chirped when I was around, and how she nibbled the treats I had in the palm of my hand. But I hope she's in a better place, eating never ending chicken treats, and do her favorite hobby, napping. I love you Noodle, and I always will. I had never thought much about chickens before my husband and I got 4 little pullets last April. Within days I was obsessed. These four little birds completely blew me away by how special and unique their personalities were. They turned me into an eco conscious, vegetarian animal lover just by doing what they do naturally. Josie was the smallest hen and the bottom in the pecking order, but she had a lot of spirit. She always got her fair share of the grapes we threw for treats. She also loved pear and red cabbage. Josie was my special friend. She always let me have a little cuddle when I got home from work, but only for a minute and then she would flap out of my arms easily when she'd had enough. When I talked to her she would cluck back at me. Watching her dustbathe and stretch her wings out in the sun made me happier than I ever thought possible. In May she got sick. We took her to the vet and she had antibiotics. She was up and down for months after that with various problems. We had her fitted with an implant to stop her laying which helped for a while, but then she started moulting which took out the last of her strength. Josie had a good day on Sunday and was running around after grapes as well as any other hen, and my husband dug up the ground in their run to help them find worms, which was her favourite game. Sadly on Monday she took a turn for the worse and showed a fast decline. She passed away in the evening, lying down in a comfy box listening to Classic FM. I think we did our best for Josie and she didn't seem in any pain at the end, just tired. I will miss her lots but hope she has gone to a better place. Because of Josie we are moving house to Devon to a place with 3 acres of land so we can rescue hundreds of ex bats. We were hoping Josie would live long enough to come with us, but we will tell all the hens about Josie and how it is because of her that we are rescuing them. Josie was a special hen and will never be forgotten. Thank you for telling us about Josie, Charlotte! What a wonderful tribute to a much-loved hen this is, Charlotte - thank you so much for sharing. The greatest tribute of all is that you're planning to move to a place where you can save ex-battery hens. That is truly wonderful. What a great legacy Josie has left behind. I wish you everything good in your new endeavour, and send you hugs and loving thoughts in your loss. Clementine was one of four young chooks we brought home as our first little clutch. Sadly we'd only had them for less than a week when an errant Shetland pony-sized dog bounced all over the little enclosed run I'd temporarily attached to their coop to help them get used to their new surroundings. In the ensuing panic, one of the chooks, Evangeline, tried to make a dash for it but was pounced on in short order and that was the end of her brief little existence. I chased the dog, hoping to at least retrieve her poor limp body but by the time I found the dog, Evangeline was nowhere to be seen. The remaining three flourished though and grew to be productive layers and an entertaining addition to our family, despite a propensity to pooping all over the paths around the house. They happily roamed around our gardens and those of our neighbours' without fuss, even bringing "friends" back with them for a free feed. But heartbreakingly, Clementine joined her sister yesterday. She'd been fine with no apparent issues, but her death came out of the blue and appallingly swiftly. Coincidentally we'd been watching the chooks from the window when Clemmy just lay down. For all intents and purposes she looked like she was getting ready to sunbathe, fidgeting around on the warm earth. But then she flopped over on her side, flapping weakly. My girlfriend Ray went and picked her up but in the few short seconds it took for me to grab a box to try and make her comfortable in so we could take her inside, she went into violent convulsions and flapped so wildly that Ray could barely hold on to her. And then she was still and that was that. Sudden, distressing and inexplicable. We accept that chickens, and birds in general, are fragile creatures prone to rapid and often surprising demise, and we shouldn't be too surprised about this but that's cold comfort really. Clementine, like Evangeline, was one of our first feathered friends, and to us, a pet, albeit one that also kindly supplied us with lovely fresh eggs and some charming antics. She wasn't even one year old and however you look at it, that's just not fair. More so for little Evangeline. Jennie was a special chicken. We found her one day running along the side of the highway, nowhere near any homes or farms. We managed to catch her, and took her home, without any idea of how to look after a chicken. We think she was a Rhode Island Red, but aren't sure. We named her after my mother, who when she was young had had cats and chickens as pets, and had dressed them up like dolls. We had multiple cats as pets, and Jennie got along with all of them. One young one, Geronimo, really loved Jennie. They would curl up together and rest. She would sit on your shoulder (and nibble on your ear). She learned how to open a cupboard door to find her treats by pushing on the bifold door with her head until it would open, and she could raid her treats. She would chat with you, and get up on your lap to sit. She was ultra curious about everything. In the evening, when it was time to go into her cage, she would roll around and cluck like she was saying "just 5 more minutes, PLEASE". When she finally learned how to lay eggs, it was always a BIG EVENT, and she would let you know, calling out. When Spring came, and it was still too chilly for her to be out full time, we would put her out in a big cage for a couple of hours. We thought that cage was safe. One evening, I went out to get her to bring her inside for the night, and she did her "just 5 more minutes, please" rollover. So I left her for 5 more minutes. When I went back out, the neighbour's husky had gotten loose, and come into our yard. As I said, we thought the cage was safe. However, there was one spot where Jennie found that she could stick her head out. I guess that is what happened. But I'm sure it was quick. We were totally devastated. It was hard to believe how much a chicken could get into your heart. Geronimo was heartbroken as well, going around the house calling for her for a few weeks. We had her cremated, and her Urn still sits on a shelf. That was five years ago. Since then, we have had other chickens (6) as pets, and have loved them all dearly. All are, or were unique in their own ways, and play with our cats, and bunnies. But as they say, "You always remember your first". And we still have in our refrigerator her very first, undersized egg. I always had one special hen in the flock - Sapphire was mine. She was the one hen my Grandad was not allowed to look at, let alone eat. All through her life (about five years) she had flown over the fence and into the garden. We would find her happily pecking around in the dandelions. We tried everything. We clipped her wings, even kept her in an separate enclosure with a few others for a while. But she always found a way out. But yesterday I went out into the garden to see Max crouching at the bottom by the fence. He was eating something, so I called him in. I thought it was grass. I went down to take a look, and she was lying there. We buried her next to her recently deceased cockerel, Victor. We will always remember you, Saffy. I never took any photos of her. I thought she had more time than she did. So sorry about your lovely chicken. How sad to hear this. You’re right, there’s always one special chicken in a flock and I’m so sorry to hear that yours was killed. Some hens are just great escape artists. No matter what we do, they just go for it at every opportunity. It sounds like Sapphire was one such chicken. And let’s be honest, what chicken can resist the temptation of lol those lovely dandelions! She loved freedom and she paid the price. But while she was with you, she obviously had a great life. We all have to balance those two things out. I hope you’re able to find another favourite chicken. She will never take Saffy’s place, of course, but she will give you pleasure - and she will have a great life in return. Warmest wishes for the future. Today I buried one of my three ginger girls. She looked a bit hunched and didn't go out to free range with the others. By the next night she had died. Sorry little one if it was something I did or didn't do for you. I was so thrilled to find you all a block away, camped under a gum tree after being AWOL for two days a few months ago. I thought after that you were all invincible! So sorry about your ginger chicken. I’m so sad to hear about your girl’s death. Sadly, it’s not uncommon for chickens to get ill and die quickly. Quite often they’re unwell but don’t show it - they know instinctively that showing any weakness is likely to attract predators. So they hide it until it’s too late for us to do anything to help. It sounds like this may be what happened to your hen. You shouldn’t blame yourself. It happens to all of us. All we can think when this happens is that while they were with us they were loved and well cared for. It sounds as though she had a lovely life, free-ranging with her friends. It’s all a chicken can ask for, really.